Folks, I will be somewhat anachronistic here by talking about Saturday's creations after posting my first blog entry on a lazy Sunday afternoon. Yesterday morning I found myself some running some errands in the Northern Bronx, so I could not resist a quick detour to Little Italy in the Bronx. Wait a second. Did I just say Bronx? I did so let's back up a bit. What I will describe is one of New York's best kept secrets. Ask a New Yorker . Little Italy ? They will all immediately think about about Mulberry Street , and think Sinatra, and then maybe Gotti. Say Little Italy in the Bronx, and many will say: what? No it is a real place, and original for that matter. And for me, a special place altogether. Like clockwork, when I was a child growing up the northern section of the Bronx, a Saturday morning visit to Arthur avenue was part of the family weekend routine. Less commercialized that Manhattan's Italian-American enclave, Arthur Avenue in the Belmont section of the Bronx, is where many Italian-Americans go shopping for some authentic ingredients. Folks bring your armchairs, tents and courage if you plan on going there during the three big holidays: Easter, Thanksgiving and Christmas. The place hosts on of the few municipal markets in New York, where you can buy fresh vegetables, cuts of meat that you might only see on TV and , of course, Mike's Deli , a salumeria like no other on this side of the Atlantic. The old fashioned municipal market is only the beginning. Situated on corner, Teitel Brothers, is a key importer of Italian delicacies and goods, especially olive oil and , salted cod fish (baccala' for the paesani). You can find them here. And of course you have your list of cafes and restaurant such as the menuless Dominick's and, the little known, but excellent Ivana's pizza which has operated, same place, same owner for over 40 years. My favorite stop however is Cosenza' fish market. It's got a special place in my heart. Having been born in city of Cosenza, seeing the name of my native city up high on a sign, makes my hometown seem famous and very meaningful to a whole world of people. The fish is good too. Indeed, I would not be a loyal customer, if it were otherwise. Friends know that I am serious when I say things like. Back to the shopping. Here are some of the goodies I picked up. On the non food related side, I picked up some Renato Carosone for Mom, and Eros for my wife. You should youtube to here their music. And now for Some Love Around the Island. 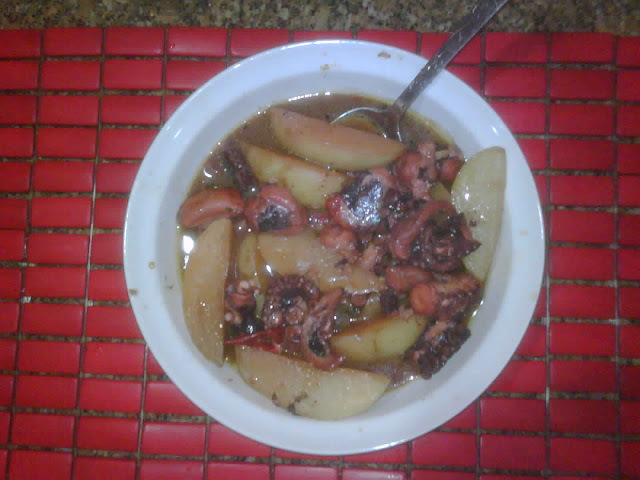 1 Handsome , adult Octopus cut up into think chunks, Saffron (whole and powered), peppercorns , white wine, 1/2 yellow pepper diced, 2 large potatoes , thickly sliced , thyme (just a bit) , garlic (crushed but not minced!) ,S/P, and EVOO . Use a wide pan with a lid and high edges 3-4 inches). The Recipe : Well use you your judgment. Remember to start the Saffron on its own before adding to the pan. Rating: Fan Club , off the chart. A classic with a twist, one of many variations. Rating: Fan Club: Off the chart. Dancing Chef. I really should have added the roasted Poblanos for some heat. Recipe: Start the veggies first, then add the Clams, wait until little guys open up. Serve on top of "al dente" linguine. Today's lesson: Next time you are in the Bronx, make your own run for the border.